Can't draw well? or have a difficult design to do? Then use a Stencil Marker or Sencil Pencil to trace a design & then transfer it to the skin. Stencil Marker good for making 100's of Stencils; also comes with Stencil making instructions. Save Money ($3.99!) by purchasing Six Stencil Markers good for making 100's of Stencils; also comes with Stencil making instructions. 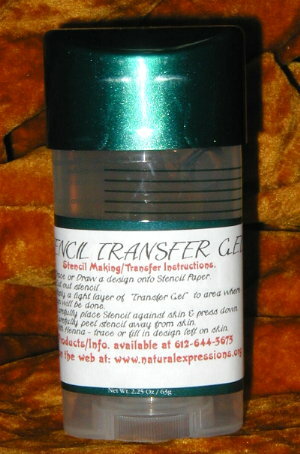 Stencil Pencil good for making 100's of Stencils; also comes with Stencil making instructions. Save Money ($3.99!) by purchasing Five Stencil Pencils which are good for making 100's of Stencils; also comes with Stencil making instructions. This is a specific brand of Deodorant/Transfer Gel needed to transfer Stencils to the skin. Save Money ($4.99!) by purchasing Six of this specific brand of Deodorant/Transfer Gel needed to transfer stencils to the skin, these seven will transfer 100's of stencils. Get everything needed to transfer/make Paper Stencils - includes: 50 9"x12" sheets of Stencil/Tracing Paper, Stencil Making Pencil, The Gel (deodorant) needed to transfer the Stencil onto the skin, and Stencil making instructions. Get everything needed to transfer/make Paper Stencils. Includes: 50 9"x12" sheets of Stencil/Tracing Paper, Stencil Making Marker, The Gel (deodorant) needed to transfer the Stencil onto the skin, and Stencil making instructions. Get the 50 9"x12" sheets of Stencil/Tracing Paper, Stencil Making Marker, Stencil Making Pencil, The Gel (deodorant) needed to transfer the Stencil onto the skin, and Stencil making instructions.